The island’s main sources of income are its modest agriculture and its open-cast iron mines, which have been worked since ancient times. The ore used to be shipped from Koutalas on the south coast, where there is now room to anchor (magnetic anomalies are reported due to the remaining ore!). Most of the anchorages in the south are now used by filthy fish farms. Moreover, apart from Livadi and the Monastery of the Taxiarchs in the north, there is not much to be seen. 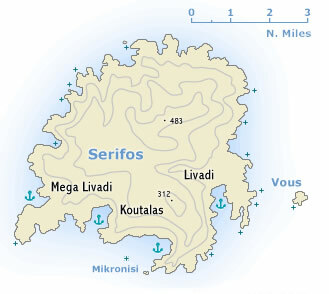 Yet, Serifos’ main port provides a safe stopover on route to the beautiful island of Sifnos.